The class 10th board examination is an important milestone in education journey of one and all. The result of your 10th board examination plays a vital role in the future course of action, including the choice of subjects in senior secondary and ultimately in pursuit of your professional journey. With so much importance attached to the grades of your 10th standard, it becomes critical that your preparation excels in every aspect. Therefore, in this write we’ll discuss the role of solving CBSE Sample Question Paper for Class 10 and why you MUST-SOLVE it before your finals. Here we go. 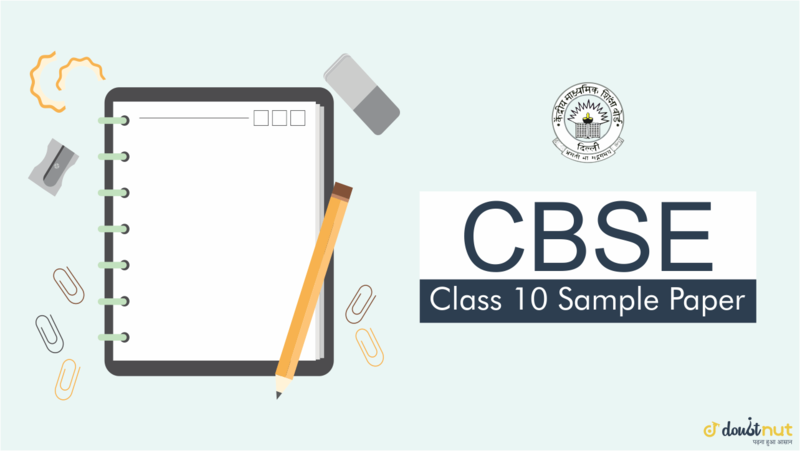 The sample papers contain most-important and most-relevant questions that have the highest weightage to appear in your 10th CBSE examination. Therefore, students must practice with the sample papers after the completion of the syllabus. It will help you in the revision of all the important topics of the examination. The sample papers are planned as per the exact time required to solve the final examination. Solving CBSE Sample Paper for Class 10 helps students in understanding the various sections of syllabus and time required to solve each section. You can strategies your planning to practice more in the areas that require more time-management. The most vital factor in any examination is your ability to be able to finish the paper with precision with the time given. CBSE Class 10 Sample Paper will increase your accuracy and enable you to attempt the paper in an error-free manner. It will eventually result in an overall good score. By solving CBSE Class 10 Sample Paper you students can gain the invaluable experience of the final examination environment. Before your finals, you must try to solve as many as CBSE Sample Paper 2019 for Class 10 within the fixed 3 hours duration of the examination. It is the best way to get the actual feel of the exam. Ultimately, on the day the examination you will be bustling with confidence. The sample papers are set according to your CBSE syllabus. Also, they are prepared by the expert professors in the same pattern of the actual board question paper. Thus, solving them will boost your confidence to solve the final question paper. CBSE Sample Question Paper for Class 10 covers all the topics of upcoming in the examination. So, they will help you in building expertise in all topics, thereby giving you a competitive edge over other students appearing in the examination. When you practice CBSE Sample Paper for Class 10, you can get the truth of your preparation. With this reality check, you identify the sections that need preparation and the ones that just require revision. It is the best way to know your areas of fortes as well as areas where there is a need for improvement. It gives you best-focused approach to your preparation. Preparation for CBSE board finals cannot be done by listening, reading and memorization. The key to achieving best grades is dedicated Practice, practice and practice! Also, there is no denying that CBSE board examination can be tricky! Therefore to make real strides in your upcoming Mat finals you must solve as many as CBSE Sample Paper for Class 10. Simply start practising now! The papers are designed very strictly with all the rules as per the latest CBSE syllabus along with the marking scheme. All these sample papers cover the important related concepts based on the exam. The question papers involve the latest questions along with the marking schemes as issued by the CBSE. All the types of questions in the question paper are all specified by the CBSE which will help in the success of Students for examinations. Also, not just the question papers, a detailed explanation, and solutions along with the marking scheme as per CBSE is provided for the purpose of self-assessment.